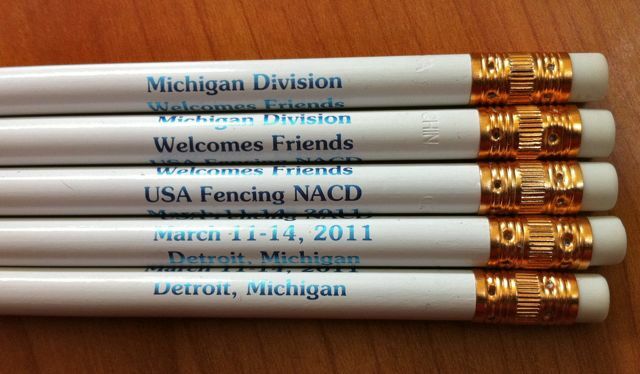 Sure, the LOC for the Detroit NAC was great. Patrick Webster and his sister, Amy Webster (who also worked as a BC trainee for the NAC), did a fabulous job creating an LOC who did everything we could have wished for to help us run the tournament smoothly. Which is, I suppose, one of the virtues of having a huge crew of LOC volunteers—at any given time, the odds of finding someone from a specific club in the division were pretty good. 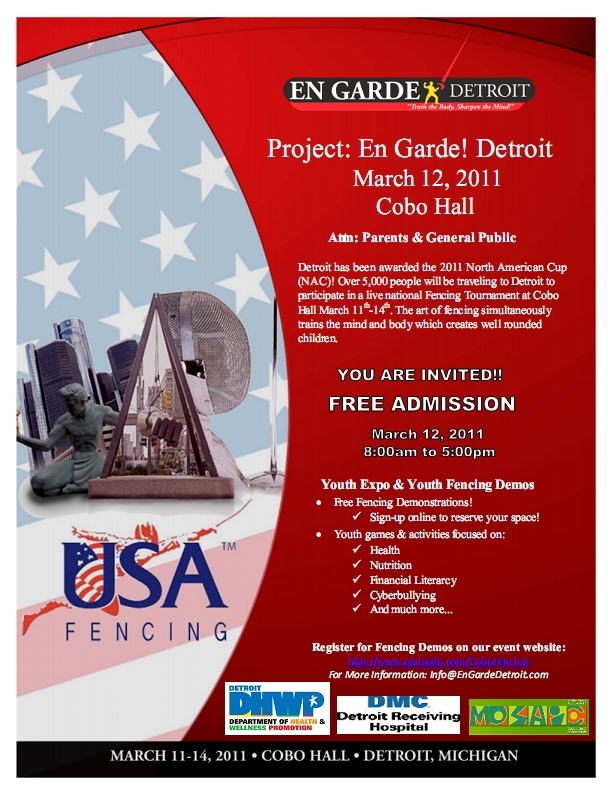 It was really nice to see a USFA division that understands that when more people are interested in fencing and find a way to learn more about the sport, all of the division’s clubs benefit. I hadn’t originally planned to go to Detroit. The March NAC is always one of the smaller USFA tournaments, so we use it for training new staff and trying out experienced staff in new jobs. (The FOC does the same with referees, mentoring new ones and allowing them to stretch their skill.) But we were shorthanded—not enough BC folk were available to staff this one, so I filled one of the empty slots. We never saw the coffee place on the corner open, even with our reasonable hours this NAC. 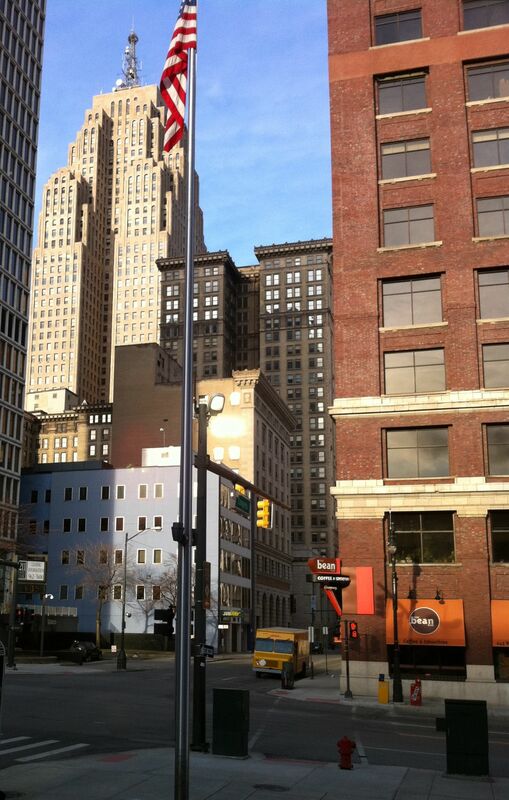 Downtown Detroit was like no other downtown I’ve ever visited. The skyscrapers are old, blocky brick and concrete—almost none of the glass-sheathed buildings you see all over in other cities. Ground floor parking areas of empty buildings are wrapped in chain-link fencing, and there’s not much traffic, even on weekdays at what would normally be rush hour elsewhere. Patrick Webster, of the local organizing committee (LOC—more about them in a bit) told me that one in every four buildings downtown is empty and that there is a multi-year demolition plan to deal with the decaying empty shells. The Peoplemover was handy for getting to the parts of town with more restaurants. We ate at a local dive bar with good burgers a couple of nights, and ventured a bit further afield to the Town Pump Tavern on Saturday night, where after 7:00 pm, we were only the second group in the entire place. (Their mac & cheese, says Joe, who tries mac & cheese everywhere we go, was one of the best he’s had.) By the time we left, the place was almost half full. The walk back to the hotel had an almost eerie, ghostly feel to it. 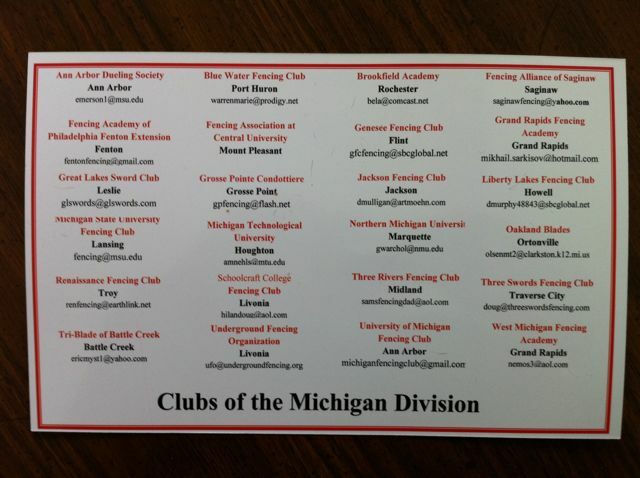 Outside the downtown area, though, there are apparently lots of very nice, very enthusiastic people, a good portion of whom signed up to work with the largest and best-organized LOC I’ve seen in more than a decade working national fencing tournaments. They put together goody bags for fencers and for officials, they provided local information and posted each day’s results at their big table next to registration, and they had multiple (as in many!) runners for the BC from first thing in the morning until late afternoon when we told them we’d have nothing more for posting. Even late in the afternoon, we had multiple minions at our beck and call. With the relative scarcity of runners so far this season, we were primed to appreciate Detroit’s minions, as they referred to themselves. But it wasn’t only the 10 to 15 minutes per round that having people to post for us saves us that was so impressive—this crew fetched and carried and cleaned up spills and more. Someone would come to the BC table with a camera they’d found in a restroom or weapons abandoned on an unused strip, and we’d merely call “Minion!” for one to immediately appear to take the info about when and where the item was found and carry it off to the LOC’s lost-and-found operation. This was the first NAC in years where we never needed to call for runners on the microphone (which was just as well, because the PA system wasn’t one of the better ones we’ve ever had). Even the plentiful supply of runners wasn’t what impressed us most about this LOC, though. But that’s for my next post.